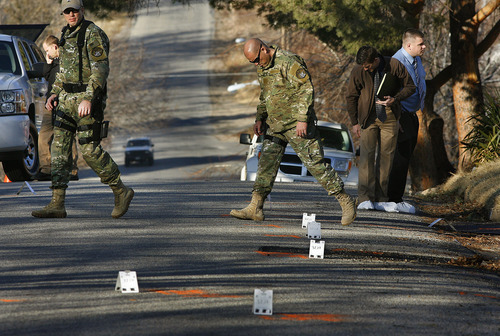 Ogden • Police dig for alleged shooter's motivation in "total chaos" that left one officer shot dead and five others injured. Kim Raff | The Salt Lake Tribune Travis Francom makes a statement about his slain brother Agent Jared Francom, who was killed, and the five other officers who were wounded in a gun battle with a suspect the night before, at the Ogden Amphitheater in Ogden on Thursday, Jan. 5, 2012. Brandon Griggs Mug. Tribune Mugs. Photo by Francisco Kjolseth/The Salt Lake Tribune 9/20/2006 Scott Sommerdorf | The Salt Lake Tribune SWAT officers walk near a home at 3268 Jackson St. in Ogden, Thursday, Jan. 5, 2012. Five police officers were injured and one killed in a firefight during a drug raid Wednesday night at the home. Evidence markers on the street outside the home led to the parking lot of an LDS Church wardhouse. 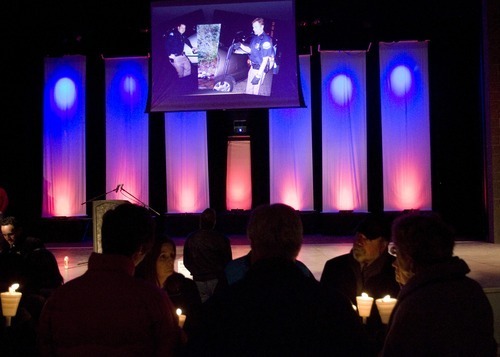 Kim Raff I The Salt Lake Tribune During a candle light vigil a slideshow of photographs of Jared Francom, who was killed, and the five other officers who were wounded in a gun battle with a suspect the night before, at the Ogden Amphitheater in Ogden, Utah on January 5, 2012. 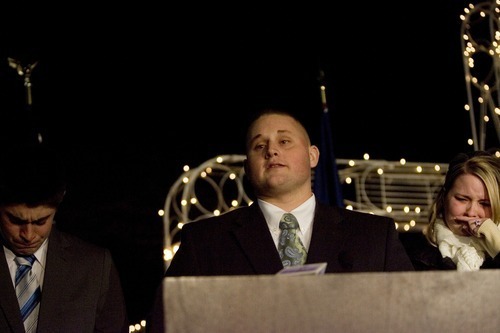 Kim Raff I The Salt Lake Tribune Ogden Mayor Mike Caldwell during a candle light vigil for Agent Jared Francom, who was killed, and the five other officers who were wounded in a gun battle with a suspect the night before, at the Ogden Amphitheater in Ogden, Utah on January 5, 2012. 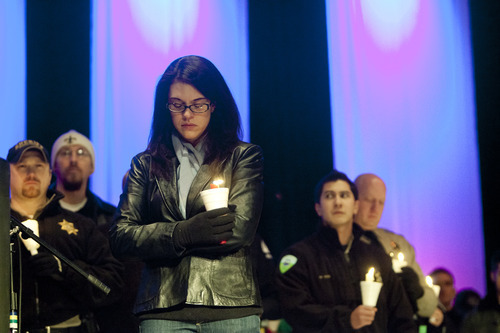 Kim Raff | The Salt Lake Tribune Erin Francom widow of Agent Jared Francom, who was killed, and the five other officers who were wounded in a gun battle with a suspect the night before, attends a candle light vigil at the Ogden Amphitheater in Ogden on Jan. 5, 2012. Kim Raff I The Salt Lake Tribune Ogden Police Chief Wayne Tarwater talks with people during a candle light vigil for Agent Jared Francom, who was killed, and the five other officers who were wounded in a gun battle with a suspect the night before, at the Ogden Amphitheater in Ogden, Utah on January 5, 2012. 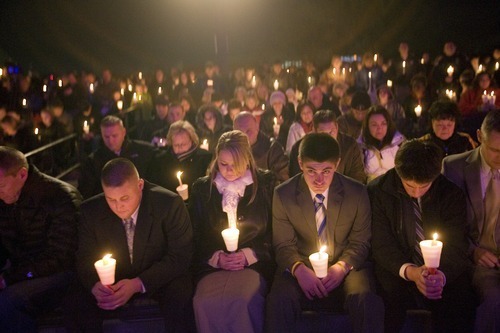 Kim Raff I The Salt Lake Tribune The Francom family during a candle light vigil for Agent Jared Francom, who was killed, and the five other officers who were wounded in a gun battle with a suspect the night before, at the Ogden Amphitheater in Ogden, Utah on January 5, 2012. Kim Raff I The Salt Lake Tribune During a candle light vigil the Francom family bows their head in a moment of silence for Agent Jared Francom, who was killed, and the five other officers who were wounded in a gun battle with a suspect the night before, at the Ogden Amphitheater in Ogden, Utah on January 5, 2012. 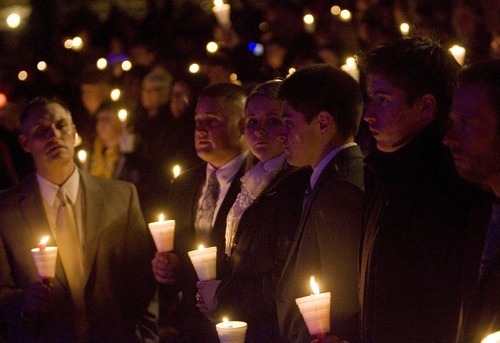 Kim Raff | The Salt Lake Tribune Hundreds of people gather for a candle light vigil for Agent Jared Francom, who was killed, and the five other officers who were wounded in a gun battle with a suspect the night before, at the Ogden Amphitheater in Ogden on Thursday, Jan. 5, 2012. Kim Raff | The Salt Lake Tribune Ben Francom, brother, slain Agent Jared Francom, attends a news conference held by his family about the death of his brother before a candle light vigil for Francom and the five other officers who were wounded in a gun battle with a suspect the night before, at the Ogden Amphitheater in Ogden on Thursday, Jan. 5, 2012. Matthew David Stewart, who is accused of shooting six police officers and killing one on Wednesday, Jan. 4, 2012, in Ogden, Utah. 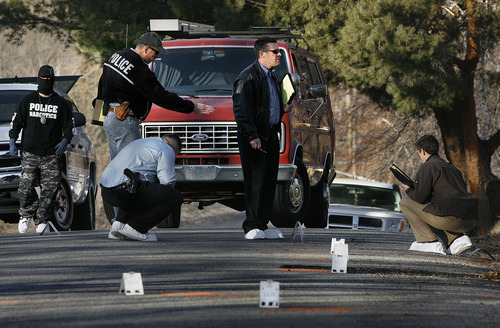 Scott Sommerdorf | The Salt Lake Tribune Police investigators look at the area on Jackson Street outside the home at 3268 Jackson St. in Ogden, Thursday, January 5, 2012. There were numerous evidence markers on the street marking the spot of bullet casings or other evidence. Five police officers were injured and one killed in a firefight during a drug raid Wednesday night. Scott Sommerdorf | The Salt Lake Tribune Police bring out various pieces of evidence from the home at 3268 Jackson St. in Ogden, Thursday, January 5, 2012. Five police officers were injured and one killed in a firefight during a drug raid Wednesday night. Scott Sommerdorf | The Salt Lake Tribune Police bring out various pieces of evidence from the home at 3268 Jackson St. in Ogden, Thursday, January 5, 2012. Five police officers were injured and one killed in a firefight during a drug raid Wednesday night. Ogden • Police are investigating why a decorated Army veteran allegedly opened fire during a routine drug-related raid Wednesday night, killing one police officer and wounding five others in a shootout described as "total chaos." Following his death, the family of 30-year-old Ogden police Officer Jared Francom said his narcotics strike force position was his "dream job." "He was doing exactly what he wanted to do," said his father-in-law, John Frisby  himself a retired Air Force colonel. But those things mean little to Francom's grieving family, which includes a wife and two daughters, ages 3 and 5, Frisby said. "He's dead and there's no solace in that at all," he said. Nothing looked amiss shortly before 9 p.m. Wednesday as the 12-person Weber-Morgan Narcotics Strike Force team approached a red brick home at 3268 Jackson Ave. to serve a search warrant, said Ogden Interim Police Chief Wayne Tarwater. No one answered when they knocked on the door and identified themselves. "There really was not a great deal that was unique, other than the outcome," said Strike Force Commander Darin Parke. When they entered, 37-year-old Matthew David Stewart allegedly started shooting. Six officers were hit, and Francom died early Thursday morning at Ogden Regional Medical Center. Three of the officers were critically wounded, another suffered serious injuries and yet another has been released from the hospital. Death penalty possible • Little in Stewart's background seems to point to Wednesday night's violence. 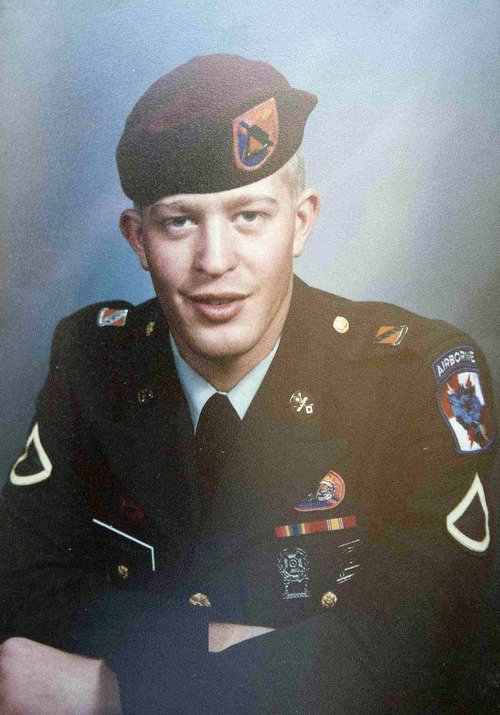 The oldest of five children, he served as an Army multichannel transmission systems operator in North Carolina and Germany for four years. He was awarded the Army Achievement Medal and a National Defense Service Medal before leaving the military in 1998, an Army spokesman said. He worked as a security guard for the IRS before getting a warehouse job on the graveyard shift at Walmart in Riverdale three years ago. A check of Utah court records shows only a traffic ticket for driving without insurance. But his father, Michael Stewart, said his son, who has "issues," may have been growing marijuana to "self-medicate." The father said they are estranged, but maintained that Matthew Stewart was not a drug dealer and may have been surprised by police. "I can't believe for the life of me why he would do that," Michael Stewart said of the shootings. "Our priorities are with the officers who are still suffering right now." Held under guard in an unspecified medical facility, Matthew Stewart could face aggravated murder as well as multiple attempted murder charges, said a tearful Weber County Attorney Dee Smith during a news conference Thursday. 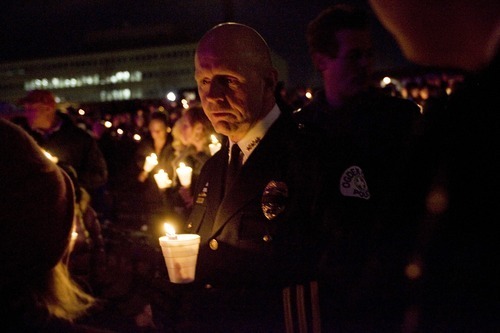 Under Utah law, killing a law-enforcement officer carries the potential for the death penalty. Investigation continues • In the aftermath of the shooting, police closed a portion of the quiet residential block that included Stewart's one-story home as a steady stream of police, Drug Enforcement Administration agents and crime scene technicians passed in and out. More than two dozen evidence markers dotted Stewart's lawn and crossed the street to a Church of Jesus Christ of Latter-day Saints wardhouse parking lot, where a collection of flowers and candles honored Francom. Bloodstains were visible on the street. 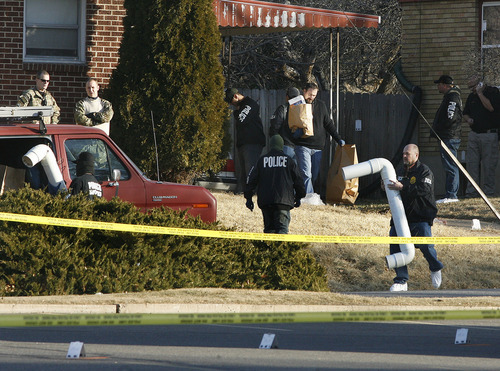 Thursday afternoon, DEA agents started removing large PVC pipes with holes in them and two long, florescent lighting systems, along with cardboard boxes and bags apparently filled with evidence. "Too close to home, it is scary," said neighbor Teresa Jacquez. Jerri Johnson, who lives two houses away from Stewart, said she watched Wednesday night from her living room window as police officers twice dragged or carried wounded officers across her front lawn. "It was an unbelievable amount of gunfire going on," said Johnson, who said she put her kids in the basement to keep them out of harm's way. Johnson called Stewart a "very quiet guy." Neighbor Cherilyn Lundwall said she witnessed the arrest. She said she was sitting quietly, reading a book in her living room as she wound down for the evening on Wednesday, when she heard "pop, pop, pop," then silence, "then a whole bunch of shots." From her window, Lundwall could see police had the suspect out of the house and were pulling him south, toward her home. They held the man underneath each arm, legs dragging. She watched as officers put the man  wearing a short- sleeve shirt  down on his side and handcuffed him. Officers recovering • As officers continue their investigation, the wounded were recovering. One, Roy police officer Jason VanderWarf, 37, was released from Ogden Regional Medical Center, the hospital confirmed. Four others were still at McKay-Dee Hospital. Ogden police Officer Shawn Grogan, 37, suffered a gunshot wound to the face, the bullet passing through one cheek and then another, said his mother, Thelma Grogan. He was upgraded Friday to fair condition and expected to make a full recovery. "He made it through the surgery with flying colors and is doing very well right now," she said. Grogan, a lifelong Ogden resident, is the handler for a drug-sniffing dog that was to enter the home after officers had secured it. He has three children and a fiancee, whom he plans to marry in June, Thelma Grogan said. "I'm totally in awe at the way the police department sticks together and the support they had for each other," Grogan said, adding that her son had wanted to be a police officer since age 3, and "loves his job." Doctors planned to keep 33-year-old Ogden officer Kasey Burrell, hit in the head and abdomen, in a medically induced coma for up to five days after he underwent both stomach and brain surgery Thursday, his brother Kyle Burrell said. Burrell's father, Kevin Burrell, said he's trying to keep a positive attitude but says he'll remain uneasy until he hears his son speak. Kyle Burrell said other officers told him Stewart had "multiple guns," and that the scene had erupted into "total chaos." The officer's wife, Natalie, happens to be a nurse at the hospital where her husband is a critical patient. The couple have two small children and are expecting a third in June. Amy Tribe, a friend, said: "She's a strong lady. She's doing the best to stay strong for the kids." Ogden Officer Michael Rounkles, 29, also remained critical Thursday. His next-door neighbor, Kari Holliday, said he and his wife are "just nice, nice people  always willing to lend a hand." Holliday, who has six kids, said the Rounkles, who have two young girls, let her children come over and play on their trampoline and their pool. Weber County sheriff's Sgt. Nate Hutchinson was ugraed to fair condition at McKay-Dee. Tarwater said that, as far as he knew, all the officers were wearing protective vests at the time of the raid. 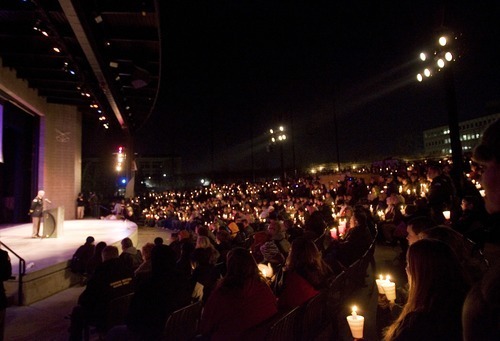 Outpouring of support • About 400 people came to the Ogden Amphitheater on Thursday night for a candlelight ceremony honoring Francom and the wounded officers. Speaking at the amphitheater, younger brother Travis Francom described the officer as "an adrenaline junkie" who went skydiving for his 18th birthday and always wanted to be in law enforcement. Jared Francom lived in Ogden until he was 6 years old, then moved to California for 10 years, graduated from high school in Las Vegas and returned to the area about seven years ago, his brother said. Travis Francom described reminiscing with another officer about "how clumsy" his brother could be. "We talked about some of the incidents he had, including his falling down on ice, falling on gravel, falling down on bare asphalt," he said. 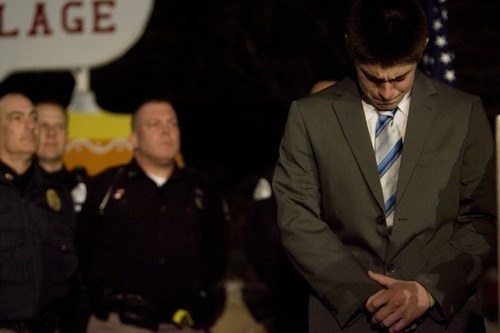 He asked for prayers for the wounded officers, as well as for the family of the accused shooter. 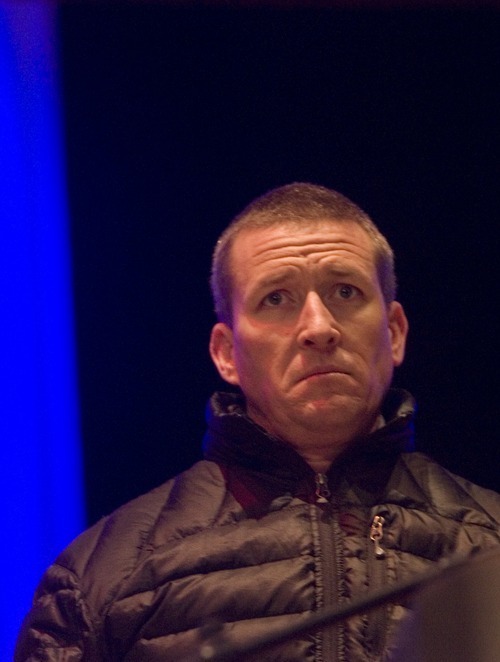 "I'm sure this must be a difficult time for them, as it is for our family," he said. After a slideshow of Francom and the wounded officers, about 100 officers from across Weber County took the stage to the sound of applause and thank-yous from the crowd, followed by the fallen officer's family. Gov. Gary Herbert asked flags to be lowered Thursday to honor Francom. Herbert met privately with families of the slain officer and those who were wounded to thank them for their "service and sacrifice." "It's a shocking thing. It's something you don't expect. Six officers shot and one [of them] killed is hard to digest," the governor said after the meeting. The Utah Department of Public Safety formally expressed its condolences in a statement, and the Utah Law Enforcement Memorial plans to offer Francom's family "financial support … in the very short term," said president Clarke Christensen. He said he expects to meet with Francom's widow within a day or two. The group will honor Francom in May when it adds his name to the fallen officers memorial at the Utah State Capitol. Jared Francom is the 134th police officer killed in the line of duty in Utah. He is the eighth Ogden officer to die in the line of duty, the last one before him being Detective Marshall White, who was fatally wounded by a burglary suspect in 1963. The Marshall White Center in Ogden is named after him. All funds raised will be going directly to the officer to whom the funds were donated. Individuals that would like to donate to any of these officers may do so by going to any Bank of Utah location and provide the name of the officer(s).